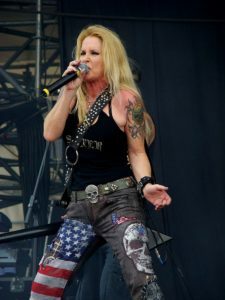 Lita Ford is an American musician who first rose to fame as the lead guitarist of The Runaways in the 70’s. Encouraged by her mother to pursue her musical interests, she took up the guitar when she was eleven years old. Almost immediately after laying her hands on the instrument, she wrote and composed her first songー”a fancy Spanish piece” as he mother later recalled. Growing up, she regularly exposed herself to music but was especially fond of the bands Led Zeppelin and Deep Purple. Recognized for her talents, Ford was eventually invited to join an all-girl rock band called The Runaways in her teen years; taking the opportunity, she soon found herself acting as the group’s lead guitarist. Together, the girls released their debut album, The Runaways in 1976 under Mercury Records. A hit upon its release, it garnered The Runaways much positive attention as an up-and-coming rock band at the time. Throughout the the rest of the 70’s, the all-girl band released three more albumsーmany of which charted in multiple countries. To date, some of The Runaways’ best known songs include Queens of Noise, Hollywood and Cherry Bomb. After the dissolution of the group in 1979, Ford made the decision to embark on a solo music career in the 80’s. Signing with their previous label Mercury Records, the former lead guitarist released her debut solo album, Out For Blood in 1983; she later followed up with a second album release the next year entitled, Dancin’ on the Edge, which ultimately saw more success than the first record. Altogether, Ford has released over half a dozen studio albums throughout her solo career; the most successful being that of the self-titled Lita which was made available in 1988. Shortly after the release of her second album, Ford received her first Grammy Award nomination for the category of “Best Rock Vocal Performance by a Female Artist” in 1985. Since then, she’s also received another Grammy Award nomination for her 1991 hit Shot of Poison and a MTV Video Music Award nomination for her 1988 classic, Kiss Me Deadly. Aside from her musical endeavours, the artist also received some screen-time on television when she was featured exclusively in the 2005 documentary, Edgeplay: A Film About the Runaways, which chronicled the history of the all-girl rock band that she was a member of. More recently in 2015, Ford was also a contestant on the reality cooking show, Chopped. So what has the music artist been up to nowadays? Where has her work brought her these past few years? 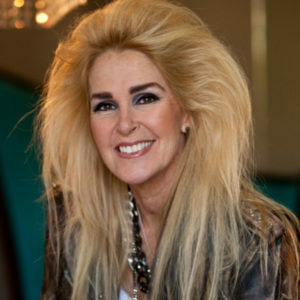 What happened to Lita Ford? Where is she now in 2018? Born on September 19, 1958, in Los Angeles, California, Lita Rossana Ford is the daughter of Harry Leonard and Isabella Ford, the latter of whom worked as a supervisor at a hospital. Growing up in the area around Long Beach, Ford took up guitar when she was eleven years old with encouragement from her mother. Almost immediately taking to the stringed instrument, she soon wrote her very first songー”a lovely Spanish piece,” which her mother later recalled. An aspiring musician, Ford drew much inspiration during that period from rock guitarist Jimi Hendrix and the bands Led Zeppelin and Deep Purple. Carrying on with her musical endeavours into her teen years, Ford continued to play the guitar, something which she’d already mastered. Around that time, she was eventually approached by a few girls that invited her to join their rock band, The Runaways. Taking the opportunity to be part of a novel, all-girl music group, she soon joined the band and became their lead guitarist; other original members included singer and bassist Micki Steele, drummer, Sand West and rhythm guitarist, Joan Jett. After gathering all the members together, The Runaways secured a recording deal with Mercury Records in the mid 70’s and went off to work on the first album; the self-titled, The Runaways was later released in June 1976. Climbing in popularity after its release, the band embarked on an American tour and performed countless sold-out concerts. Upon the release of their debut effort, it received much praise from critics, many of whom compared the band’s musical style to that of The Stooges and Led Zeppelin. Produced by Kim Fowly, the two-sided disc contained ten hard and punk rock tracks including Dead End Justice, which has since been covered by popular American artist, Kristen Stewart. Another highlight from the album was the song, Cherry Bomb; listed as the “52nd Best Hard Rock Song of All Time” by VH1, it has also been featured in numerous films such as Guardians of the Galaxy, Dazed and Confused and RV, amongst a couple of others. The best-performing track from the album, its eventual single reached number 106 on the US Billboard Hot 100 Chart and topped both the Scandinavian and Japanese Singles Charts; it also peaked at number two in Ukraine. The following year, Ford and her bandmates released their second studio album entitled, Queens of Noise in January 1977. Although it was essentially a hard rock album, it incorporated many other influences from blues rock, heat metal as well as punk rock. While many consider it to be comparable to that of their debut work, the album is noted for putting much greater emphasis on both musical sophistication and volume. The Runaway’s best performing album in the United States to date, it consisted of ten tracks, a handful of which were co-written by Ford. Commended for its “improved studio sound” by contemporary music critics, Queens of Noise peaked at number 172 on the US Billboard 200 and at number twenty eight in Sweden. The album went on to spawn one single, Heartbeat which made its way to number 110 on the Billboard Hot 100 Chart in the US. Coming out with two full-length albums in one year, The Runaways released their third studio album, Waitin’ for the Night in October 1977. Their first record to feature the girls as a quartet, it was fairly successful in Europe although it failed to be a major hit in their native United States. Given a modest C+ rating from the “Dean of American Rock Critics” Robert Christgau, its hard/punk rock track-list consisted of ten songs, two of which were composed by Ford. Waitin’ for the Night saw the most success in Sweden where it reached number thirty-four on the Albums Chart shortly after its release. One single, School Days was later released as a single; although not an overnight sensation, it did go on to peak at number twenty-nine on the Ultratop 50 Belgian Singles Chart. Prior to their dissolution in the spring of 1979, the all-girls group released one final studio album entitled, And Now…The Runaways. Distributed via Polydor Records and Cherry Red Records in the US and UK respectively, it was known for including more glam-rock oriented sounds in its track-list compared to their preceding album. Produced by John Alcock, And Now…The Runaways showcased a total nine songs, one of which featured Ford as its lead vocalist (e.g. I’m a Million). Although the album failed to chart, it was given a modest three star rating from critics at Allmusic. A few years after its original release in 1981, the record was re-issued as a picture-disc under the name, Little Lost Girls. After the band went their separate ways due to alleged creative differences, Ford returned to the music scene as a solo music artist. The former lead guitarist released her first studio album, Out for Blood in May 1983. Produced in collaboration with Artie Ripp, Joel Soiffer and Neil Merryweather, the album featured a very heavy metal-inspired Ford, who was seen holding a blood-spurting guitar on the original cover art. Her first solo endeavour, Out For Blood included ten heavy and glam metal tracks including Stay with Me Baby, Just a Feeling, If You Can’t Live with It and Any Way That You Want Me, amongst others. Although Ford was applauded for her “abundant guitar skills” in the album, it ultimately did not chart in the US. It wasn’t until the spring of 1988 that Ford received a break in her solo music career with the release of her third studio album, Lita. Her first record with RCA Records, it was met with favourable reviews upon its release; it currently holds a four and a half star rating from the UK based Kerrang! Magazine. Largely a hit, the self-titled album peaked at number twenty-nine in the US Billboard 200 chart and also reached number forty-two and forty-five on the Canadian and New Zealand Albums Chart respectively. In addition to the success of the album, it also spawned several single hits including Close My Eyes Forever, Kiss Me Deadly, Falling In and Out of Love and Back to the Cave; Close My Eyes Forever eventually became the best-performing song, having peaked at number eight on the Billboard Hot 100. Her most successful album to date, it has received Platinum certification from the RIAA for selling over a million copies in the US as of 1989. Just this October, the heavy metal artist was featured in Favored Nations Entertainment’s all-female compilation record, She Rocks, Vol. 1. According to the label, the collection will be produced by Steve Vai and Brad Tolinski and will showcase elven different female guitaristsーwith Ford being one of them; other musicians to be featured include Sarah Longfield and Nita Strauss. Currently still under works, the compilation album is set to be released the following year on January 20, 2017 in collaboration with the Women’s International Music Network. 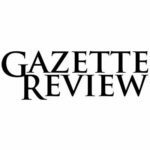 A highly anticipated project for many, it will also be celebrated at the She Rocks Awards in 2017. Speaking of the awards ceremony, it was also announced recently that the acclaimed guitarist will be heading up on stage at the event as a recipient of the 2017 She Rocks Award. Since its inception, the She Rocks Award has been paying tribute to women in the music scene who have both displayed leadership and have stood out within the industry. Some of its previous honourees include Raining Jane, The Bangles, Chaka Khan, Sheila E, and many others. Now on its fifth year, the 2017 She Rocks Awards Event is set to take place at the Anaheim Hilton Hotel in California on January 20, 2017. If that’s something you’d be interested in, do know that tickets for the ceremony are still available for sale! 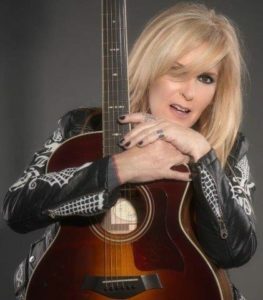 If you’d like to connected with the heavy metal guitarist of The Runaways Fame, you can do so by following her on social mediaーyou can find Lita Ford active on Twitter (@Litaford) as well as on Instagram (@litafordofficial). Don’t forget to also drop by her official Facebook page (@litaofficial) and website (litafordonline.com) for some of the most up-to-date news on the star!